Pants There are 6 products. 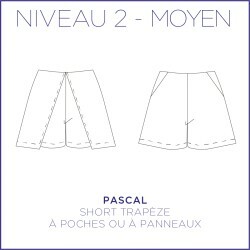 Pascal, it's a short trapezoidal short with or without front panels and pockets. 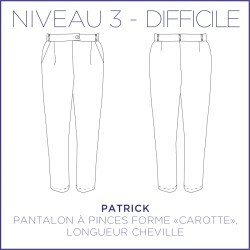 Patrick is the trendy pleated carrot pants with dard ! 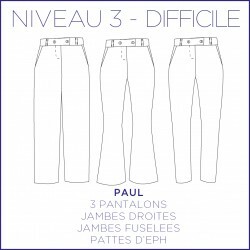 Paul, it's 3 trousers, waistband wide, straight legs legs "paw of efp" and fitted legs. A must-have for your wardrobe ! 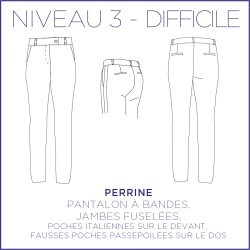 Perrine, it is a striped tapered leg pants with italian pocket on the front and fake welt pockets on the back. Stripes are everywhere this winter, Perrine is in this trend. 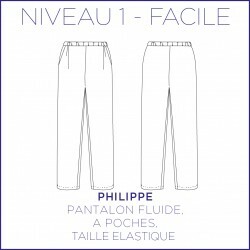 Philippe, it's a large and fluid trouser with pockets, comfortable and indispensable in summer ! 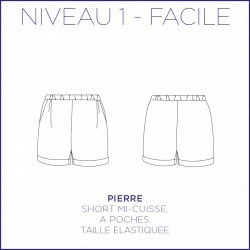 Pierre, it's mid-thigh short with pockets and elasticated waist that are easy to make and wear !